Imagine how much the time you wasted on retyping and resubmit blogs or ads to hundred of websites. 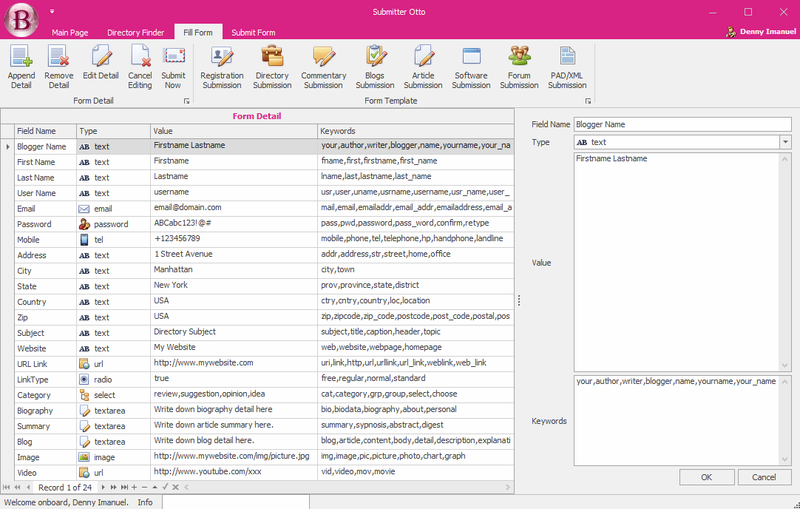 This nasty apps not only help you to quicken your form submission process to any directory, blogs, or forums, but also help you find new directories or listing. Search Directories This app helps you discover any directory you have never known before. Your scope of networks and marketing profits are limitless Only Fill Once You don't need to repetitively key in the form thousand times. Just fill it from the common template once for all. Semi Automatic As there are million of web design, there is no such a thing as fully automated web filing. Build with OCR to recognize Captcha, you can review all your submission process one by one. Statement: First, please download the orginal installation package by clicking the download link. Of course you may also download it from the publisher's website. Using Submitter Otto crack, key, patch, serial number, registration code, keygen is illegal. The download file hosted at publisher website. We do not provide any download link points to Rapidshare, Hotfile, Depositfiles, Mediafire, Filefactory, etc. or obtained from file sharing programs such as Limewire, Kazaa, Imesh, Ares, BearShare, BitTorrent, WinMX etc. Software piracy is theft. If you like Submitter Otto please buy it.